In my first Retail Intelligence column, “Profit from Education: How to Build a Successful In-Store Education Program,” I discussed the steps needed to design a classroom space and how to go about filling the instructor role in a successful education program. My second column in this series, “Profit from Education II: Building a Curriculum That Drives Customers to Your Classroom,” showed how to address the steps, tricks and techniques a photo retailer should take to build an effective and winning education curriculum. But having a wonderful facility and great curriculum isn’t going to fill the seats of your classroom. You also have to let people know about your education program. Communicating in an entertaining and informative way is key to making it all work. So in “Profit from Education III,” we’ll look at the 15 steps necessary to effectively market your education program and turn that classroom into a profit maker. 1. Website Wonderful: Your website needs to have every class listed with a great picture, a perfect and accurate description, a link to the instructor’s website and the price for the workshop. This is not easy but a must for successful education marketing. Customers will go there first to confirm dates and information on a class. Having a site where customers can sign up and pay is a big plus, but it is not required. Just make sure you quickly answer all requests for sign-ups and information. A website that conveys you are serious about education is one of the biggest steps your store can take to be a success. 2. Event Calendar: The people most likely to attend classes are the ones shopping in your store. Place a large event calendar in your entranceway. It should be the first thing people see when they enter the store. Education is your difference maker; it conveys the message that you are an experiential store and an authority on photography. 3. Signs, Signs and More Signs: Signs for your workshops should be in your outside windows, at every register, all around the store, and even in the bathroom (yes, I did that). Keep them simple, clean and easy to read. If, for example, a Panasonic Lumix speaker is coming to give a workshop, make sure you have signs on the Lumix display. 4. It’s in the Bag: I am not a big fan of printing stuff, but sticking a one-page, colorful and easy-to-read handout on classes in customers’ shopping bags has a high success rate. They get home excited about their new toys and you have their full attention as they unpack their gear. 5. Store Salespeople Should Be Selling: They should not only be selling cameras but your services—especially classes. Create an incentive program for your salespeople. I would give a $5 or $10 spiff for a class sale. Salespeople should be informed and tested regularly on what classes are being offered so they can intelligently speak to customers about them. 6. Follow-up on Sales: Calling customers who bought cameras and equipment and asking them if they are satisfied is good business. This is a perfect opportunity to discuss upcoming classes with them. 7. E-mail Every Week: This is a key to driving people to your classes. A colorful, informative and well-designed e-mail should be sent every week to your customers. This e-mail should only be about education. There should be no attempts to sell products in it. It should look the same every week with a listing of the month’s upcoming classes at the top for a quick view. Customers will appreciate this and start to think of you as an experience store, not just a place that parts them from their money. 8. Social Media Is a Must: Classes need to be posted on your social media, and you should post pictures and relevant updates daily in the week or two before a class. A little Facebook advertising can be effective here, too. You can target your audience precisely, and a $20 spend will buy a lot. I would also contact a visiting instructor and ask him to reach out to his audience via e-mail or on social media and talk about the class and share the sign-up link. Popular instructors have fans all over. It’s time to get them into your store. 9. Vendors Can Help: If you have vendor-supported speakers, they will be glad to feature your event on their website and social media. But you must press them. And then press them again when they ignore your first request. 10. Relevant Product Incentives: While you should not directly link product sales to education advertising, it is okay to offer an incentive on products for a class. For example, if you have a Lumix speaker coming in, offer no sales tax on all Lumix products or a free giveaway with a purchase. It can’t dominate the class marketing, but customers appreciate this kind of class attachment. Make sure not to violate MAP rules here. To avoid that, offering it verbally in-store to customers is the way to go. 11. Get Them Again While You Have Them: Have your instructor let the students know about the next relevant class. Offer an incentive, like a reduced-rate, early bird special to sign up right then. They should be excited about having just experienced a fantastic class. Also, as an owner, I would speak in front of larger classes to let them know how proud I was of our education program and about some cool classes that were coming up. 12. Survey the Students: Every customer who takes a class should be asked by the instructor to fill out a survey while in the class. This makes them feel involved and cared for. Make sure you ask them what classes they want to see you hold next. You will get great ideas about what should be next. And when you run the class, you’ll already have potential students. 13. Advertise Classes More Than Product: You are selling experience. If you focus your advertising on product sales, you start competing directly with Amazon and B&H. The more you advertise education and the less you advertise product, the more product you will sell. 14. No Free Classes: You get what you pay for. When you offer free classes you are telling people your education program is worthless. Even when the vendor is providing the speaker and they insist on it being free, I insist on at least charging $10 and giving back the $10 in a gift card. 15. Owner Involved: The education model must start at the top. It sends the message that your education program is key to the store’s success and you are serious about your customer’s experience. You should be in front of customers often, talking about your program and teaching a class or two. My own workshops were some of the best attended, and the customers who participated almost never bought anyplace else again. 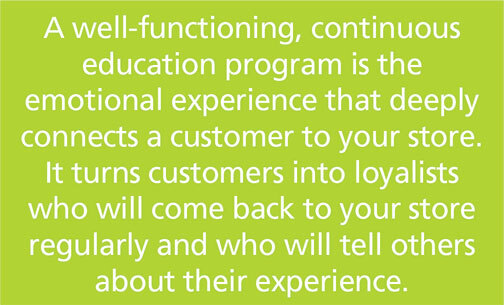 A well-functioning, continuous education program is the emotional experience that deeply connects a customer to your store. It turns customers into loyalists who will come back to your store regularly and who will tell others about their experience. It’s also something that you can offer that the online and NYC stores can’t do for your customer. You now have the formula to build and also run a successful photo education program and make your store a big success. Just do it—now.